Monkey was born in 2012 which means he was born in the Chinese Year of the Dragon. At the time my Hubby was travelling to China a fair amount and having a Dragon baby was highly desirable. This year Chinese New Year falls on the 8th February. 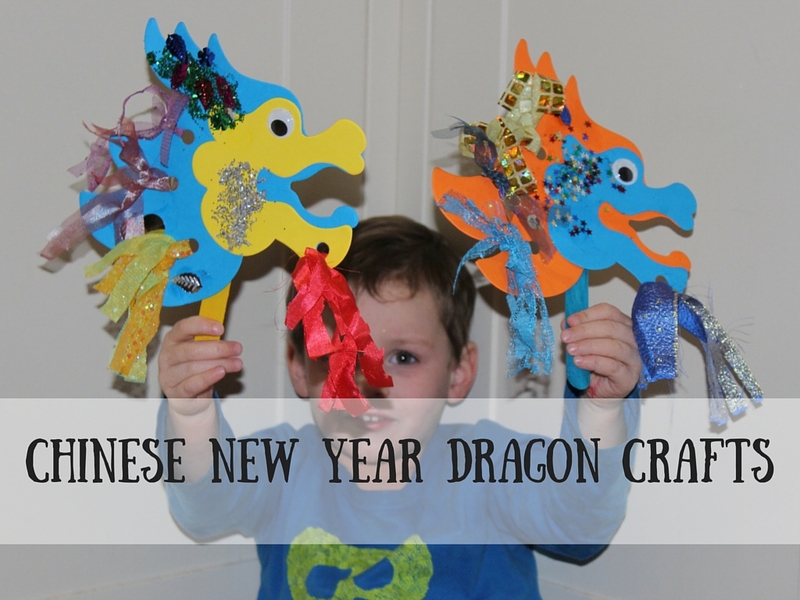 So when we were contacted by Springboard Supplies about reviewing some Chinese New Year crafts we chose the Dragon options! If you have not come across Springboard Supplies before they are a family run business who specialise in supplying educational resources to schools and other organisations. Their products are curriculum based and their intention is that they will act as a ‘Springboard’ for children to enhance their education. They sent us three kits, Monkey chose to try out the Tactile Dragon Kit first, I am not surprised the coloured strips of fabric looked very appealing. Like me he loves anything which has multiple textures. 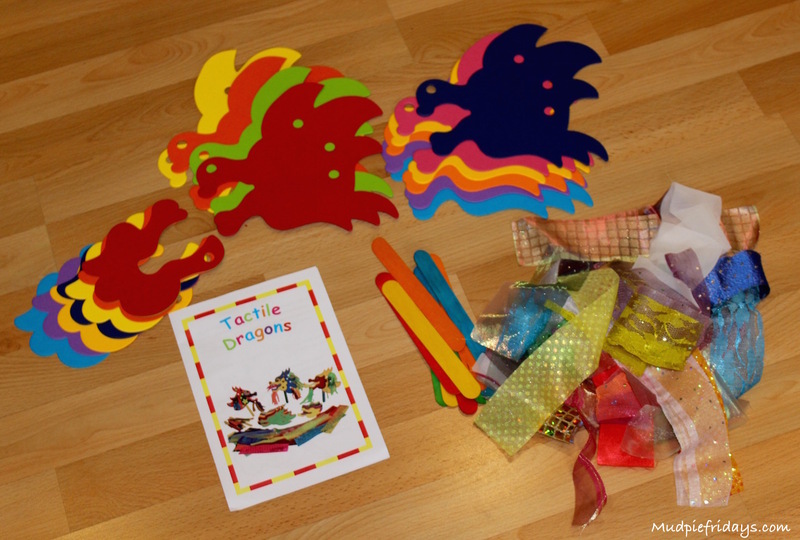 As they are designed for classroom use they come in packs of 30, the set includes pre-cut dragons, fabric strips, jumbo craft sticks and a instructions and ideas leaflet. 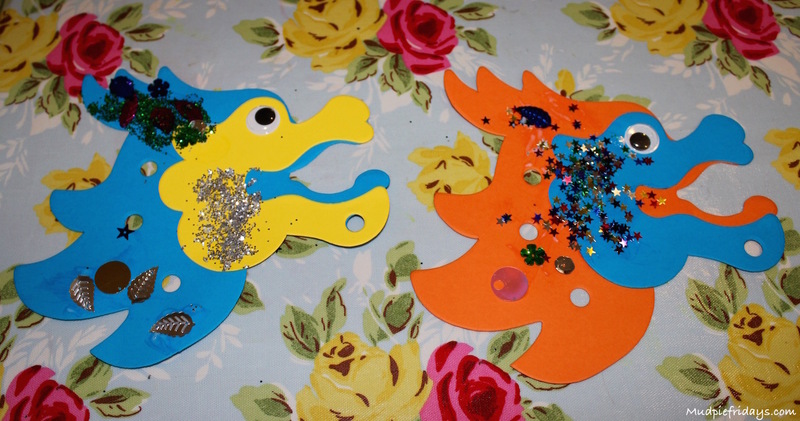 We added glitter, sequins and some goggly eyes. Monkey chose the blue Dragons to start with and got started on decorating them straight away, we added the corresponding faces before we started decorating. Purely because I knew the glitter was going to go everywhere. I have a feeling this might of been his favourite part. He loved pouring the glitter on and then shaking it off. We then needed to wait for the heads to try before threading through the ribbons in the pre cut holes. Monkey threaded the ribbons well although he needed help with tying the knots to secure them. Once secured you cut the ribbons to make them look like tassels. In the end he gave up with the cutting and asked me to do it for him. But at only 3.5 years old cutting silky ribbons can be quite tricky. 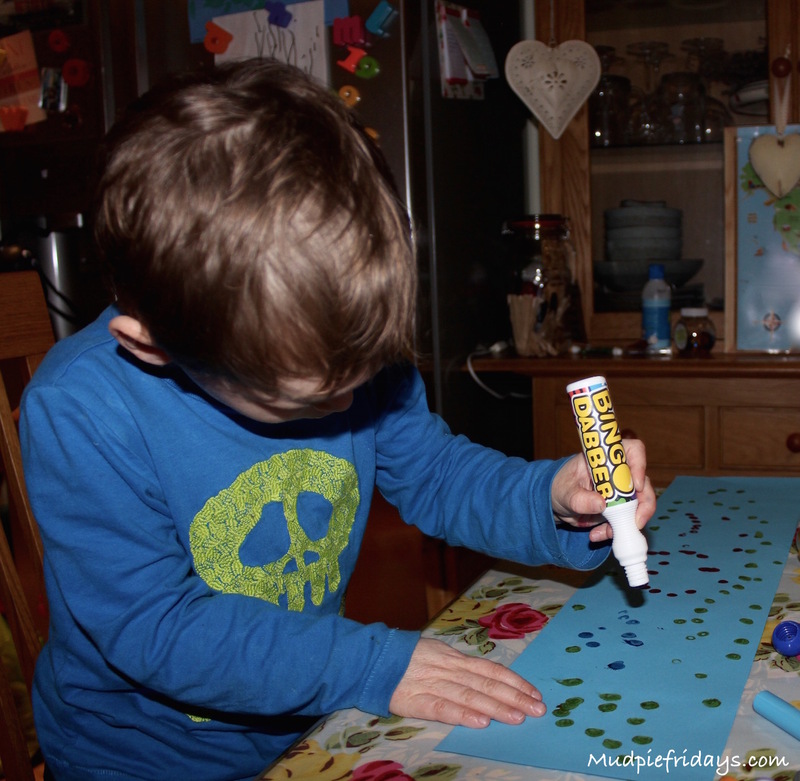 We then added the jumbo craft sticks (blue again – theres a surprise) with tape. The kit retails at £11.95 plus VAT. 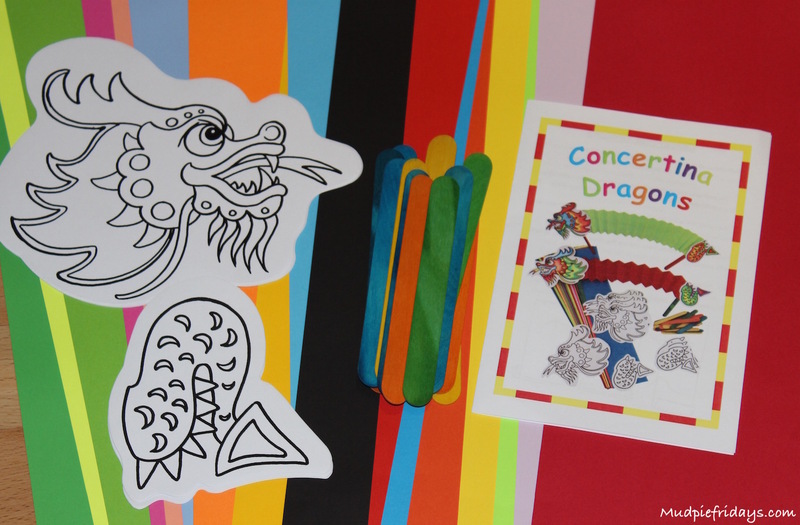 The lovely people at Springboard Supplied also sent us two further kits the Concertina Drgaons and the Dragon Spirals. Both of the dragon activities in these kits took less time to complete so maybe more suitable when time is tight. 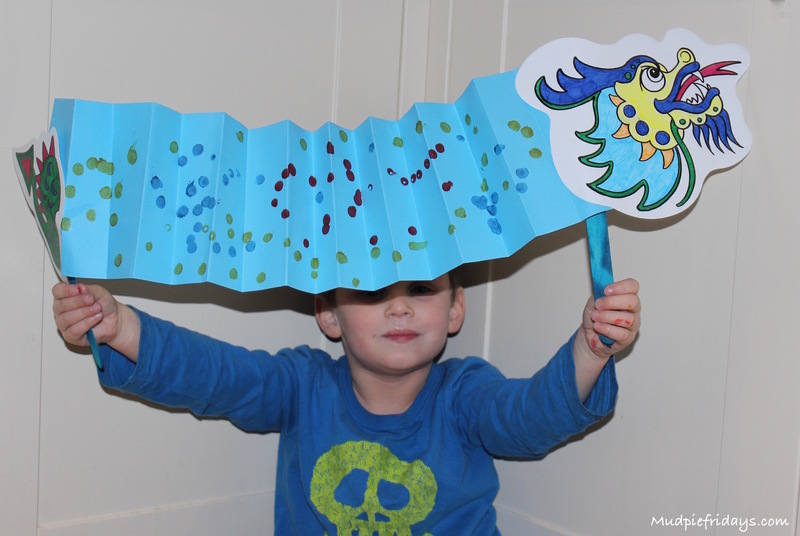 Next Monkey chose the concertina kit, in it you get long strips of coloured paper, pre printed and cut dragon heads and tails ready for your imagination to decorate them, as well as jumbo craft sticks and clear instructions and ideas leaflet. Monkey set to work decorating the concertina ‘body’ while I coloured in the head and tail for him. No surprise he chose the blue option again. Once the ink was dry I showed Monkey how to fold the paper into a concertina. He had never tried this before and actually didn’t do a bad job once he got his head round not trying to roll it. I think we will practice folding paper as he really enjoyed it. Watching him think about it logically made me very proud and I think it also helped his coordination as he folded it one way and then the next. 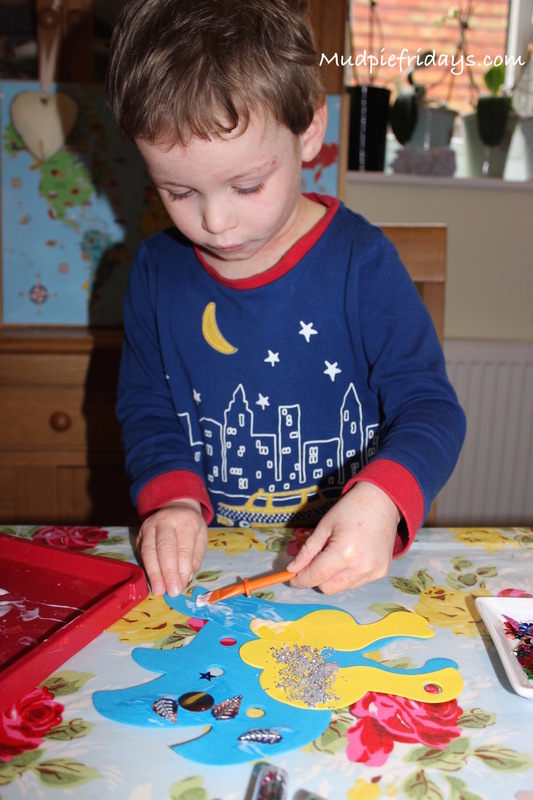 We then attached the head and tail with glue and the jumbo craft sticks with sellotape. The kit retails at £7.95 +VAT and includes enough material to make 30. 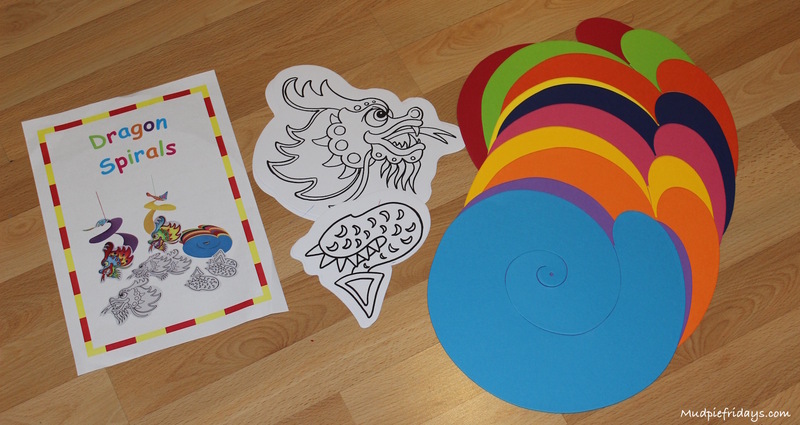 The final kit we were sent was the Dragon Spirals and was probably the simplest of the three. It comes with pre cut spirals and printed dragon heads and tails to decorate. 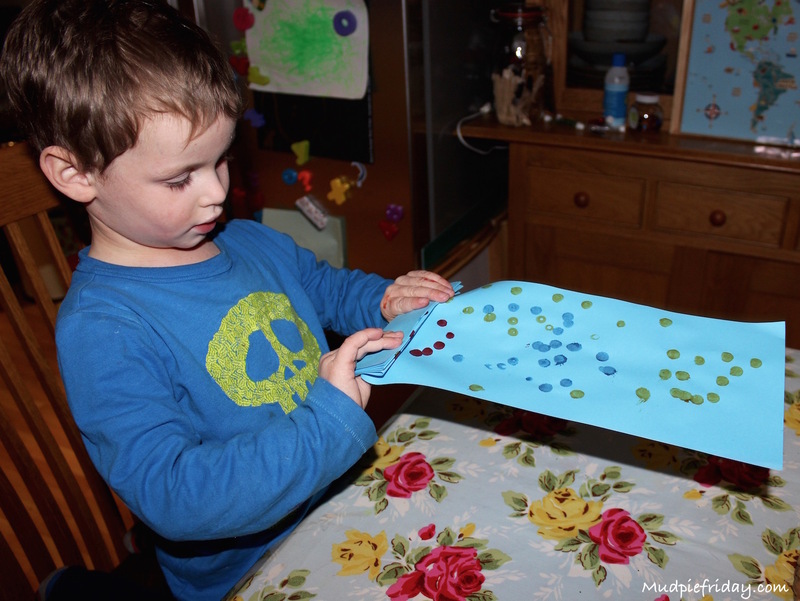 Monkey opted to decorate his with felt pens, although the paper is thick enough to take paint, glue, sequins and glitter. The Dragon Spiral kit retails at £7.95 + VAT again for a packet of 30. Thank you Springboard Supplies for sending us these great kits. They look great and that’s my kind of craft. When you just need a bit of colouring and sticking! OOh so colourful and vibrant! I like that you teaching him about global cultural traditions and it looked like a lot of fun to make. 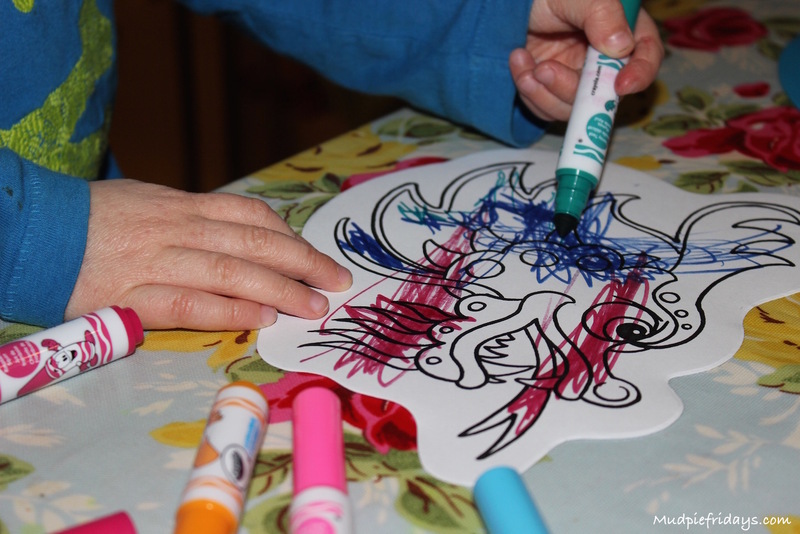 Lovely idea – my daughter and I are both dragons (which might explain a lot!). Really nice to have a kit that preschoolers can properly attempt themselves too. Aw they look fab! 🙂 I must do something with my girls. Oh we adore a great craft kit and this looks wonderful. My little man would love to make these too. Looks like great family fun. 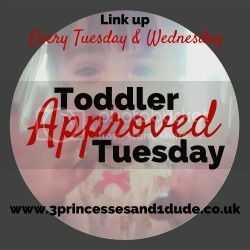 they are so cool – I think they even outrank dinosaurs (must be the glitter) what a great idea! What a great idea. I haven’t heard of springboard before but will definitely check them out. I’m rubbish at crafts so kits like this are perfect for me. Thanks for sharing. How cute! I love Chinese dragons, we often have a street procession go through to celebrate Chinese new year. The dragons are amazing and they have very loud drums too! What a fun activity. 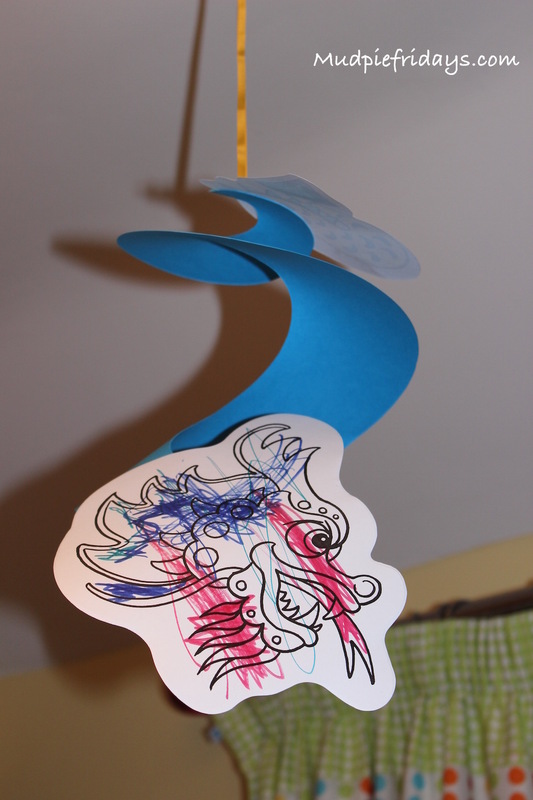 My kids love dragons and pretty much anything that’s fantasy. I love that he chose sparkles. My 6 year old boy likes sparkles too …my 4 year old girl won’t wear anything with a single sparkle on it. Thanks for hostessing lovely! I keep meaning to do some crafts with the girls around the Chinese new year. These look fantastic and like you I have a Dragon! How cute! It looks like he is having so much fun with this project!! And it turned out beautifully!! Thank you for sharing with Everything Kids! We can’t wait to see what you have to share with us next week!! I like the look of this activity!